Haldimand. - This Township contains a population of 1967 souls; has been settled many years; the soil in front is of the first quality, in rear rather light. The village of Grafton in this Township is increasing rapidly: -- bounded south by Lake Ontario. Murray. -This Township contains a population of 1938 souls. The villages of Trent, Carrying Place, and Brighton, are in a flourishing state; -- there is an Episcopal Church and resident clergyman in the village of Carrying Place. Percy contains a population of 667 souls; generally good land. Hope contains a population of 2772 souls. The town of Port Hope, situated near the mouth of Smith Creek, on Lake Ontario, is in a flourishing state. There is an Episcopal Church, and resident clergyman in the town of Port Hope. Clarke contains a population of 1119 souls: is fast filling up with English settlers. The quality of the soil is generally excellent. Asphodel contains a population of 465 souls, principally Irish and Scotch. It is bounded on the front by the river Trent, navigated by steam vessels. There are two saw mills and one grist mill in the township, and a small village, Kelso, is growing up. The land is generally of a middling quality; some part of the township is very good. Douro contains a population of 771 souls, principally Irish, with the exception of some respectable English and Scotch families. This Township is connected on its south west corner with the town of Peterborough; contains much good land. Mariposa commenced settling last season; the very best land, and finely watered; contains about 400 souls. Otonabee contains a population of 1062 souls - English, Irish, and Scotch. The township is bounded south by the Rice lake, and west by the Otonabee river; both navigated by steamers. There is one saw mill and one grist mill in the township, and a village, Keene at Gilchrist’s mills. The N.W. corner of Otonabee is connected with the flourishing town of Peterborough by a bridge across the Otonabee river . The best encomium that can be passed on this township is that the inhabitants are generally in good circumstances, owing to their industrious and sober habits, the good quality of their land and their proximity to the markets of Peterborough and Cobourg. Emily contains a population of 1295 souls, principally Protestant Irish; excellent land. There are tow sawmills, and one grist mill in the township. Cartwright.-This township is unsettled from the circumstance of a great part of the township having been granted to militia men, for their services during the late war. The sale of lands under the Absentee Act, will now throw the township open to settlers; and being well situated, having a water communication from Lake Scugog, which takes its rise in the township, to lake Chemong, within six miles of Peterborough, and as a steamer will ply on those waters next season, this township will undoubtedly have a great run. Smith contains a population of 953 souls - English, Irish, and Scotch. This township is connected on its south east corner, with the town of Peterborough - the contemplated rail road from Peterboro’ to lake Chemong, will pass through this township by the communication road. The settlers in this township are generally wealthy - a sure proof that they are industrious and that their lands yield in proportion to their industry. Hamilton contains a population of 3871 souls; there are in this township two extensive flouring mills, and ten saw mills. The town of Cobourg, situated on the banks of lake Ontario, contains the Grammar School, Episcopal Church, and a resident clergyman; an office of the Bank of Upper Canada and an Agency of the Commercial Bank of the Midland District. There are settled in Cobourg, and vicinity, many respectable and opulent English, Irish, and Scotch families. The society of Cobourg and vicinity is considered equal to any in the Province. Ops commenced settling in 1830, contains a population of 845 souls; there is a first rate flouring mill in this township; the steamer that is now building will ply through the centre of the township on the Scugog river. The Government lands are entirely taken up by settlers, and none for sale in township excepting 3000 acres. The soil of this township is considered equal to the flats on the Mississippi and the German flats on the Mohawk in the United States. Dummer opened for settlement in 1831. No return of its population has been made; supposed to be about 500 souls - principally English, many of whom were sent out at the expense of the Marquis of Bath - industrious and contented. The major part of the township is good land. Cavan contains a population of 2373 souls, principally Protestant Irish, a very industrious, loyal, and respectable body of people, in good circumstances - the quality of the soil throughout this township is tested by the thousand of bushels of grain that annually flood the markets of Port Hope, Cobourg, and Peterborough. There is a resident clergyman, and an Episcopal Church in this township. Monaghan contains a population of 1050 souls, Irish, English, and Scotch; is bounded south by the Rice lake, and east by the Otonabee river, the town of Peterborough is situated on the N.E. corner of this township. The soil of Monaghan is generally allowed to be of the very best quality. Manvers. - This township has laboured under the same disadvantages, and for the same reasons as Cartwright. Its proximity to the flourishing settlements in Cavan has induced many settlers to encounter its wilds, under every disadvantage, as the quality of the soil is of such a nature, as to insure the industrious emigrant a full return for his labour. Darlington contains a population of 1298 souls; is bounded in front by lake Ontario; generally the very best of land, watered by hundreds of beautiful trout streams. The extensive mills of Bowman and Smart are centrically situated in this township, where a village has commenced, and an Episcopal Church is about to be built. Cramahe contains a population of 2005 souls. The village of Colborne, in this township is rapidly increasing. Alnwick is totally unsettled, owing to absenteeism. A large portion of the township lately sold for taxes, will open it for settlement. General Remarks - The district of Newcastle, deservedly called the favourite district of Upper Canada, is bounded on it southern frontier by the magnificent Lake Ontario, and in addition to this vast advantage, the front townships abound in numerous crystal streams, bursting from innumerable springs that take their rise along the chain of high lands that divide the waters of the interior from the Ontario. - Many of these beautiful streams are successfully used in driving all kinds of mills and machinery. The waters of the interior are distant from Cobourg, twelve miles, and may be navigated by steam vessels, eastward as far as Healy’s Falls, in the township of Seymour, on the River Trent, thirty six miles; and northward ascending the Otonabee River to the town of Peterborough, twenty-five miles. The rapid waters of the Otonabee, north of Peterborough, are avoided by a short carrying place of six miles, across the isthmus in Smith, to Chemong Lake; -- from whence there is an uninterrupted steam navigation for eighty miles, on waters that pass the townships of Smith, Ennismore, Emily, Verulam, Harvey, Fenelon, Ops, Cartwright, Eldon, and Mariposa; to this may be added a further navigation of several miles in the Home District, by a lock at Cameron Falls, in Fenelon, which would open a steam navigation within a few miles of Lake Simcoe. 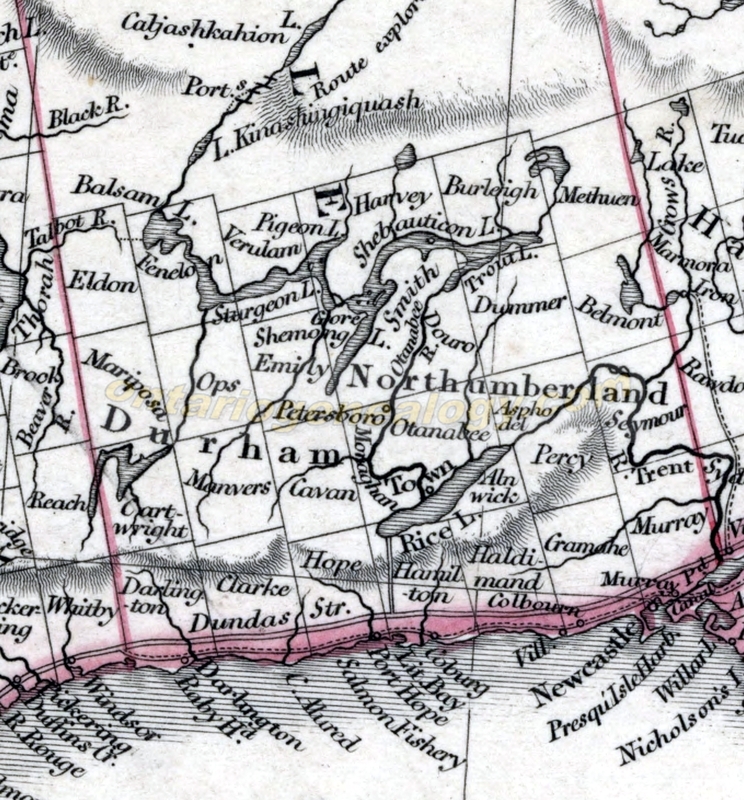 The soil of the Newcastle District is admitted to be generally equal to the best in the Provinces, and it is allowed to be the most healthy part of Upper Canada; many respectable families have settled, previous to, and since 1825, in the neighbourhood of Cobourg and Peterborough, to which last season has brought a large accession of wealth and respectability. The emigration of British settlers to the Newcastle District commenced in 1817 - 18, a number of families, (who probably unaware of the localities and situation of Upper Canada, emigrated to the United States, ) were humanely directed here by Mr. Buchanan, the British Consul at New York ; -- from that period to 1825, there was a small annual increase; in the latter year about 2000 were settled in the neighbourhood of Peterborough by the Honourable Peter Robinson. For the last three years there has been an increase of from two to three thousand annually. The Newcastle District in 1817 contained a population of barely four thousand souls, and only two very small villages in the whole district: the census of the present year, 1833, will shew a population of nearly 30,000 souls - and the district now contains the following towns and villages in a flourishing state of advancement: -- Cobourg, Peterborough, Port Hope, Grafton, Colborne, Brighton, Carrying Place, and Trent; -- also just commenced, Bewdly, Claverton, Sully, Campbelton, Howard, Keene, and Kelso.